– The massive ransomware attack that crippled more than 20% of hospitals in the United Kingdom and disabled systems in as many as 74 countries appears to have been inadvertently stopped by a 22-year-old computer security researcher in England who began studying it Friday afternoon. The ransomware appears to have first appeared at 3:24 a.m. ET on Friday, said Craig Williams, a senior technical leader at security company Cisco Talos. His day job is as a security researcher at Los Angeles-based Kryptos Logic, but he was actually supposed to be on vacation this week so he hadn’t been plugged in. Although only 22, he is known in the close-knit world of cybersecurity as someone who’s good at “taking down big ugly things that are spreading fast,” in the words of Ryan Kalember, vice president for cybersecurity at Proofpoint, a Sunnyvale, Calif.-based security company. First credit to actually getting a sample of the malicious software code appears to go to Kafeine, a security researcher who doesn’t give press interviews and only goes by his screen name, but who works for Proofpoint. Malware Tech called him “a good friend and fellow researcher” in his blog post and noted that Kafeine passed him the sample so he could begin to reverse engineer it to see how it did what it was doing. He promptly registered that domain, for $10.69, so he could see what it was up to. This was at around 3 p.m. in London, 10 a.m. ET. He started seeing connections from infected victims, hence his ability to track the ransomware’s spread. The registration wasn’t done on a whim, he noted. 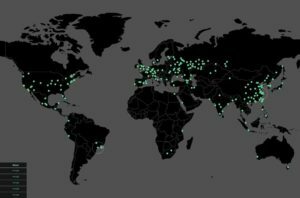 “My job is to look for ways we can track and potentially stop botnets (and other kinds of malware),” he wrote on his blog. The malware contained computer code that pinged an unregistered Web address, and if it didn’t get back a message saying the address didn’t exist, it would turn itself off. Computers that were already infected with the ransomware weren’t protected but the ransomware stopped spreading except in isolated systems.